Mysterious murders, mad scientists, and secret codes: take on the roles of Edgar P. Jacobs' famous characters and solves these strange cases to bring about order and justice. But take care! The villainous Olrik is on the prowl and he'll try to foil your plans. The game is cooperative: each player embodies one of the illustrated characters and has access to some information via their personal booklet. 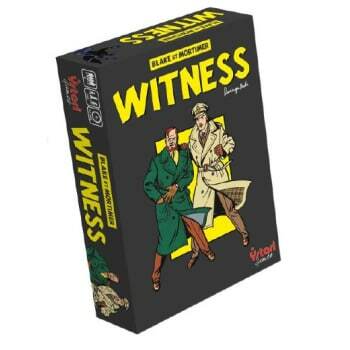 Then the players whisper clues to each other in the course of 4 specific phases, so that everyone can try to piece together the solution of the case, which takes a bit of memory, logical analysis, concentration ... and sense of humor, because the cases contain a few traps... Be ready for the challenges!